Travel with Kevin and Ruth! : We can see the light at the end of the tunnel! It had rained hard Thursday night, but we think it stopped around 4am Friday morning. When we got up, the ground was still soaking wet, even though the sun was peaking through the clouds occasionally. We decided to wait out the morning and let things dry out a bit more before finally hitting the road again. We had been parked up at Eagle Plains, Yukon for about two and a half days by the time we finally left at around 11:00am. And the road was actually drier than we thought it was going to be. I had forgotten just how bad it was on this stretch though. At times, we were crawling. In fact, after the first hour, we had done 31 kms (19 miles)! The second and third hours weren't much better. But, the scenery made up for it. 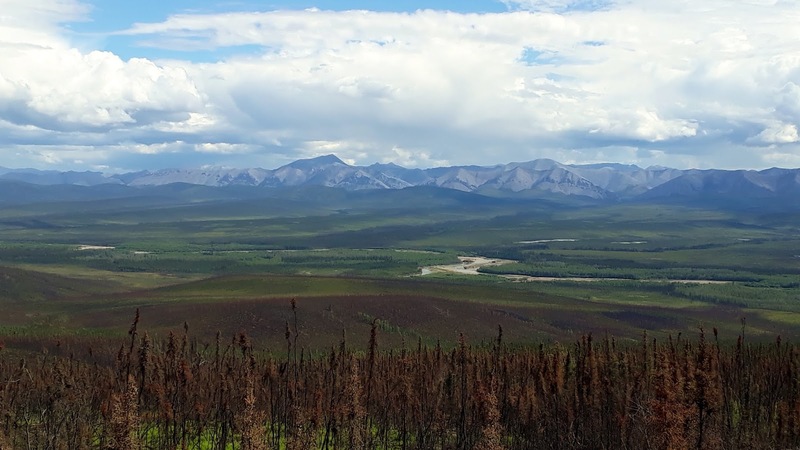 The Yukon section of the Dempster Highway definitely has nicer scenery than the Northwest Territories section. What's this coming our way?? These things operate all over the world! We've seen one in Prince Edward Island, Canada, and we've seen one in Valladolid, Mexico. Really popular with the Germans, but for us? No thanks! Don't forget, you can click on the picture to make it full screen! By the fourth hour, the road had improved. I think we managed 45 kms (28 miles) during that hour! Now, you have to understand that Sherman doesn't do bumpy roads well. If we were driving a pickup truck, or ever a car I'm sure we would have made better time. Sherman was sure enjoying the great scenery and the blue sky! Almost time to call it quits for the day. From the time we left at 11:00am, we stopped for a quick lunch break, and then a forty five minute snooze a little later on. And by the time we got ourselves parked up at 7:15pm, we had done 230 kms (143 miles). Our actual average driving speed was 36 km/h (22 mph) for 6 hours and 25 minutes! But, we can see the light at the end of the tunnel. We are now only 70 kms (43 miles) from our hike Saturday morning at Tombstone Park and last we checked they're calling for a beautiful sunny day! Let's hope they got it right! And after the hike, we're off to Dawson City. You definitely need to make a trip up north, just make sure you give yourself lots of time to enjoy all there is up here. Long day but it sure looks beautiful. We're gonna have to get there one day....Soon !!! Yep, it was a long day of very rough roads but definitely worth it when you get to see this gorgeous scenery. We saw one of those Rotel buses at the campground we stayed at in Bryce National Park in Utah last month and I thought it was awesome! The people that book these are pretty plucky IMO. Yep, as Kevin mentioned you see them all over the world. It looks like they have a fun time and it is a requirement that they have to do their share of chores, like help with food preparation and with cleaning up after meals and helping set up and take down camp. It could be a very interesting time providing you all can get along. What beautiful Yukon country. I'd love to do Rotel bus tour...going to check them out. I read you're back in Dawson with this post. Can't wait to see your hike. 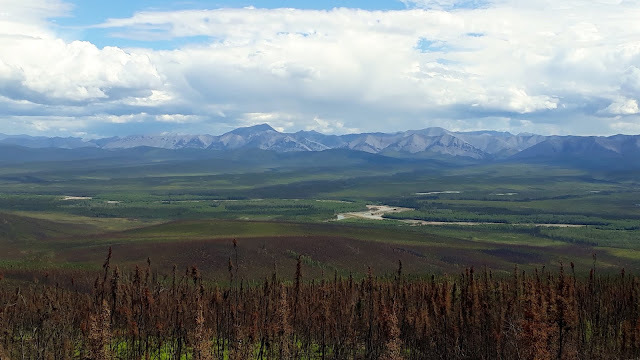 Yukon is definitely a beautiful part of Canada, and relatively quiet tourist wise which gives you lots of wide open spaces to enjoy it all that much more. Slow going but taking your time and enjoy the scenery.enjoy your next destination. Great post! I don't get a chance to read all your posts but I love them when I do. We only have a few years to retirement and you're a great inspiration. With scenery like that you don't need to go fast... Awesome pictures. My kind of scenery !!!! Great pics of the scenery; excellent Travelogue which we enjoy. Safe journey. We could not tolerate that road for an hour in our motorhome, much less for 6+. Thanks for sharing your gorgeous photos, though; that way we don't have to! The photo at the top of your blog with the two of you is so wonderful -- maybe my favorite of yours so far, and that's saying a lot with all the beautiful photographs you take. I just said to Kevin how much I love the photo, it almost looks like we were photoshopped into the picture but we remember just about every step of the way! Glad you both arrived safely at Tombstone Park. Great picture of the two of you. Next stop Dawson City enjoy! Fantastic photos and the header photo is by far the best one for me👍👍👍👍continúe with your safe travels and blog. Thank you Lynnette, we love that photo too!